From our archives: Anglers at the Depot Crown Reserve stretch. MIRAMICHI – With the ides of June upon us, there are salmon making their way into the river systems as we prepare for the summer season. Striped bass have just about finished spawning and are now dispersing into the Gulf of St. Lawrence rivers and bays. The black flies and mosquitoes are in full swing. So it is time to grab the fly dope and head to the river. W. W. Doak and Sons in Doaktown said the best report they had was from anglers who dropped in on their way back from the Northwest Miramichi. They had hooked 11 fish between four rods. They also heard that the Keswick River in the Restigouche system was also fishing well. On the Southwest Miramichi they had reports of four to five salmon being seen in the Upper Blackville area. Trout reports were limited to the “Catch ‘Release section of the Cains River. Generally, water conditions were good for the time of year, but some rain would soon be in order. Flies of choice were Glitter Bears, Same-Thing-Murrays, Butterflies and Green Machines on no. 6 hooks. Andrew Anthony of Ledges Inn in Doaktown and Mountain Channel in the Rapids area said there had been one salmon caught at Mountain Channel on Monday, and they had been seeing fish at the Ledges in Doaktown, but they would not take as the water was getting down and a bit warm the early part of this week. Cooler temperatures on Wednesday and showers in the forecast off and on during the next few days should improve fishing. There were still some river trout in the 8-14 inch range. Shad were reported in the Blissville area. Flies of choice were Shady Ladies, Cossebooms, Glitter Bears and Green Machines on no. 6 hooks. Herb Barry Sr. of Herb’s Fly Shop on the Station Road in Blackville said angling there was quiet as nobody was fishing. The only action was centered around four fellows who had caught some nice three-pound trout. One person with a permit to scoop shad was only getting striped bass every time he put the net into the water. He said they were spawning in the Howards area. Water conditions were good. But perhaps a tad low for the time of year. Flies of choice were Muddlers and Black Ghosts. Curtis Miramichi River Outfitting in Blackville said there were not many anglers out, but they had heard of a few bright salmon and a grilse. There was an odd trout such as a four-pounder caught on the Cains River. The water temperature was good and the levels were good for both fishing and canoeing. There were a few spots open for their spey casting clinic this Saturday, June 17 from 9 a.m. to 4 p.m. Cost is $120.00. Flies of choice were Butterflies and Green Machines on no. 6 hooks. Jim Laws of Miramichi Hunting and Fishing in Newcastle, Miramichi reported angling as very slow with the striped bass certainly winding down until the fall. There were a few reports of salmon on the Northwest. Trout were scarce, especially smaller ones. Generally, water conditions were good. Flies of choice were Green Machines, Butterflies and Black Ghosts for salmon and bass flies for the stripers. 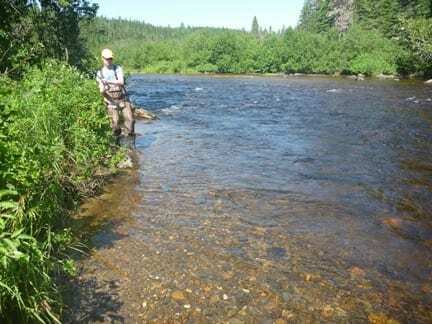 Syd Matchett of Trout Brook Fly Shop on the Northwest Miramichi said angling was quiet the first part of the week. There had been some reports of salmon last week with five reported by a group of three, and a salmon and grilse Saturday. There were a few trout in the 12-14 inch range. The first crew into the Crown Reserve Elbow stretch ended up with only a few trout, no salmon and two flat tires. (Not sure what was used to get the tires to take). Flies of choice were a variety of Green Machines, Shady Ladies and Butterflies on no. 6 hooks. Debbie Norton of Upper Oxbow Outdoor Adventures on the Little Southwest Miramichi said they were busy with the black bear spring hunting season, and were not fishing at the moment, but they had heard of some salmon on the Northwest, but they were not taking well. There were no trout reports and the striped bass fishing was winding down with an estimated 80 per cent spawning complete. Flies of choice were Butterflies, Green Machines, Shady Ladies and Black Ghosts. So as we hit the mid point of June, there are salmon in the system and the grilse should be along soon on the Northwest, so get out and “on the water”. ANY FINANCIAL CONTRIBUTIONS TOWARD HELPING WITH THIS COLUMN ARE GREATLY APPRECIATED. 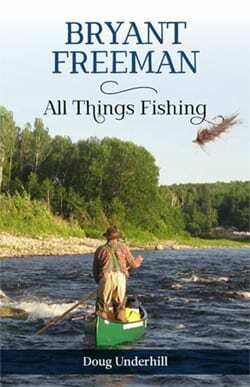 Both Doug Underhill and Bryant Freeman will be at Cabela’s on Saturday June 24 between 11 a.m. and 1 p.m. to sign copies of Doug’s new book BRYANT FREEMAN: ALL THINGS FISHING. Bryant will also be tying some of his famous Carter’s Bugs. So join them and pick up some pieces of NB’s fishing lore, and probably a few stories as well. Fly tyer Elaine Gray will be Cabela’s host and probably tie a few flies as well. Hope to see you there! The Coalition for Better Salmon Management (CBSM) now has a website at salmonnb.com, which has been expanded and updated. It already has a membership over 1,000 and is a major voice for salmon conservation here in New Brunswick. In Newfoundland coastal ice may be having some effect on Atlantic salmon coming into the rivers, while on the Restigouche the numbers appear better than in 2016. Read the full review for the week. Lewis Hinks writes a blog post on putting in the West River Sheet Harbour counting fence in Nova Scotia this past week. Great photos! ASF Biologist Graham Chafe documents the completion of smolt tagging, a key part of ASF’s at-sea tracking program. Base Gagetown is best known as a proving ground for the Canadian Forces, but environmental rehabilitation work has also been taking place. The base allows students from several area schools to release salmon fry raised through the the Fish Friends programs. An event took place this week. Chain Pickerel Eating Atlantic Salmon Smolts in LaHave River, N.S. A new biological survey is finding that Chain Pickerel, an invasive species, are preying on significant numbers of Atlantic salmon smolts. Investigations have resulted in yet more convictions in a Newfoundland court. The post Miramichi Fishing Report for Thursday, June 15, 2017 appeared first on Giver on the River. This is a syndicated post. You can view the original post here: Miramichi Fishing Report for Thursday, June 15, 2017.